You and Shimshon Spicehandler like this. Simcha Hochman ‎"and the spoonfull of coffee was more important than the six spoonfulls of sugar" GIVALD! Simcha Hochman The sage pronounce the holy name: Na, and took the cult to one location, but he wasn't satisfied, so he invoked a double name: Na Nach and took them to another location, he was still not satisfied, so he invoked in triplicate form and quadrupled the name: Na Nach Nachma Nachman, and from then on they were from Uman. Refael Tzvi Gartenberg was it from the kum kum of zahav and the cos of margaliot? Simcha Hochman the secret of "kavvey" to keep us up! Simcha Hochman maybe your confusing Rabbainu with someone else, could it be? 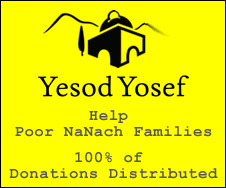 Simcha Hochman didn't Rabbainu say that we should have faith in H"Y to provide us with the money we need and not to resort to things like that?